In fact, even members of the opposition, many of whom reportedly participated in the world-renown vote-auditing process, which includes several different levels of electronic and manual auditing, had agreed at that time that the process had been carried out fair and square. It wasn’t until they lost (and in the months leading up to the audited elections) that they cried foul. 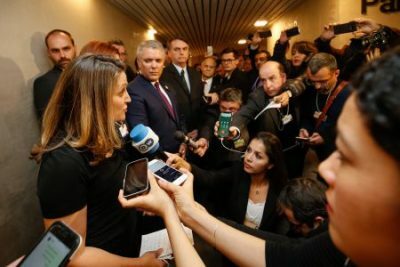 What’s more, contrary to the media’s narrative that the elections were rushed by Maduro – which parrots the Canadian Foreign Affairs Ministry’s position – the elections were held when they were, largely at the request of the opposition. As for the claim that Maduro barred individuals or parties from running in the elections, the truth is that it was the Constitutional Chamber of the Supreme Court of Venezuela (not Maduro) who disqualified certain parties due to violations of the aforementioned electoral process. 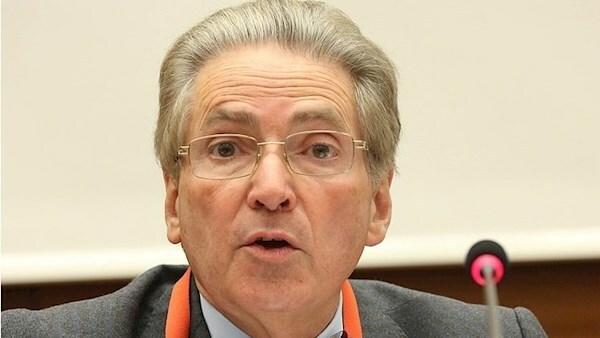 On Jan. 25, 2018, the Canadian delegation’s report states that the Court “ordered the (Electoral National Council) to exclude the MUD from ballot validation process” after ruling that the coalition’s structure, “the consolidation of various political organizations, some renewed and others pending renewal violated the electoral process.” Essentially, Burbano explains, the coalition was trying to double-dip by putting forward representatives as both individual candidates and as parties. They weren’t really trying to “rig the system,” he says, “but play the system.” Other opposition members like Leopoldo Lopez and Henrique Capriles – two of the most popular ones – were not able to run because they have been either accused, tried and convicted of crimes or barred from running due to corruption. Currently, Lopez is serving a 14-year prison term, which has been commuted to house arrest due to “humanitarian measures” taken by the supreme court, The Guardian reports, for inciting the violent 2014 protests that claimed several lives. And in 2017, the Comptroller General’s office barred Capriles from holding public office for 15 years “on the ground of alleged misconduct, though no bribery charges were brought against him,” according to a report by Venezuelanalysis.com. Active among Venezuelan right-wing student activists, Gray Zone writers Dan Cohen and Max Blumenthal say Guaido grew up learning to undermine the socialist government. As a politician, he immersed himself in the “most violent faction of Venezuela’s most radical opposition party, positioning himself at the forefront of one destabilization campaign after another.” This made him prime meat for Washington. In The Ugly Canadian: Stephen Harper’s Foreign Policy, for instance, Yves Engler notes conversations between Canadian, American and Venezuela opposition officials who, aware of the U.S.’ dirty history in the region, colluded on how Canada could inject themselves in the country to serve as the intermediary. Canada is “a country that can deliver messages that can resonate in ways that sometimes our messages don’t for historical or psychological reasons,” Thomas Shannon, a US diplomat had quipped following Chavez’s 2006 reelection. Gordon confirms this. Canada’s aggressive interference in Venezuela, for instance, began under the right-wing government of Stephen Harper, who, like his US counterparts, felt threatened by Venezuela’s anti-capitalist, anti-Washington stance. As early as 2006, when Chavez won with 63 percent of the vote, Canada was the only member of the OAS to join the US in denouncing Chavez’s legitimate victory. For instance, in a CBC interview late last month with Burbano of Common Frontiers, the host took what many listeners on Twitter later described as a “combative” tone. During a short eight-minute interview on the CBC’s As It Happens, host Carol Off seemed uninterested in Burbano’s side of the story, which contradicted the calamitous picture she had been trying to paint. But Off pushed ahead with her script, claiming that neither of them could opine on the matter since they didn’t live there but, in the same breath, asserting: “This is a humanitarian crisis.” Burbano pointed out that what he said was based on what he experienced, which had been confirmed by many others who had also visited the country, including De Zayas, whose detailed UN report Burbano mentioned repeatedly. Off made no attempt to inquire about that report. Burbano also mentioned the human rights violations that mar other countries supporting Guaido like Colombia, for instance. Off ignored that too. Indeed, in a particularly revealing freudian slip, US National Security Adviser John Bolton admitted during a Fox News interview that Venezuelan oil was their main target. In fact, it didn’t take but a day following Guaido’s unconstitutional declaration for those in high commands, and virtually all of the military, to openly and publicly support Maduro and denounce Guaido. “We, the Homeland’s soldiers, do not accept a president imposed in the shadow of obscure interests and self-proclaimed outside of the law,” Padrino Lopez, Venezuela’s Defence Minister, Tweeted in Spanish on the 24th of January, reported Sputnik News. That same day, Maduro delivered a speech from inside Venezuela’s Supreme Court alongside other delegates and the military’s various high commanding officers. 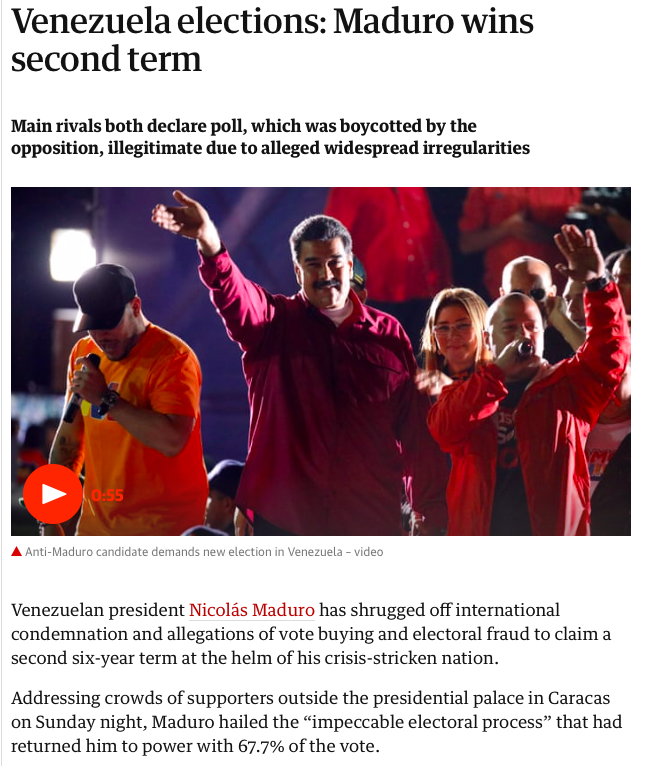 Additionally, while the media continues hyping the number of countries that are backing Guaido, the number that support Maduro are also rising. Yet, in a world where geopolitics reigns, perhaps more important than how many, is who is supporting Maduro and who is supporting a US-led coup. For instance, among the top US supporters are Brazil, who is currently led by an extremist right-wing fascist; Ecuador, led by a traitor of that country’s Citizen’s Revolution who is currently leading the nation down a neoliberal path; and Colombia, a major and recognized violator of human rights, to name just a few. At the very least, the solidarity actions which are happening across Canada prove that not everyone is drinking the kool-aid. Canada’s largest union, CUPE, representing over 700,000 workers has publicly denounced Canada, the US and Guaido for their attempts to foment a coup, according to a released statement. CUPE “rejects any attempt by the Canadian government to interfere with the democratic processes and sovereignty of the Venezuelan people,” the public statement says. Memebers of Canada’s NDP have also denounced Canada’s move, most notably Nikki Ashton.